My Father's World has had the privilege of influencing secular publishers to edit the content of their books. Walking along-side these publishers, MFW's editorial team has been able to change evolutionary language to more neutral language acceptable to most audiences. The primary change in many resources is to simply change phrases like "millions of years ago" to "many years ago." 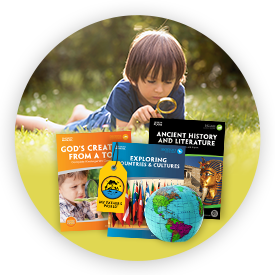 Please pray that God will open the door for My Father's World to work with other publishers in the future. *The publisher of The World of Science allowed us, with the assistance of Master Books, to change the overall tone of this book to glorify God for His amazing creation.